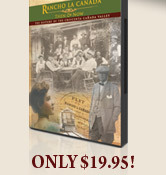 "Rancho La Canada: Then & Now" is a feature length documentary about the history of the Crescenta-Canada Valley. The film is divided into THREE PARTS. Each Part is self-contained and can be viewed separately. The DVD also includes over an hour or rare never-before-seen footage of the valley - such as home movies shot in Flintridge in the 1920s; German Festivals in La Crescenta in the 1930s; Indian Springs swimming pool in the 1940s, and much more! *No returns but any defective DVDs will be replaced.